From Flashnet to Shirdi, top Modi government minister hides details of key business dealings. New Delhi: In a hitherto undisclosed business deal that took place after he joined the Narendra Modi government as minister, senior BJP leader Piyush Goyal sold the entire stock of a privately held company he and his wife owned, at nearly 1000 times the face value, to a group firm owned by Ajay Piramal – a billionaire with substantial interests in the infrastructure sector including power. The sale took place in September 2014, after Goyal had been a minister for four months. The transaction is of questionable propriety because neither Goyal’s ownership of the company – Flashnet Info Solutions (India) Private Limited – nor its subsequent sale appears to find reflection in the mandatory statement of assets and liabilities he made with the Prime Minister’s Office in 2014 and 2015 as a minister in the government. The sale also invites allegations of conflict of interest and crony capitalism as the Piramal group not only had business interests in power and new and renewable energy but went on to extend its investments in the sectors. At the time of the sale, Goyal was minister of state with independent charge of power, coal and new and renewable energy. His dealings with the Piramal group is the second instance of Goyal’s proximity to corporate India to come to light in recent weeks. In both cases, the minister has been less than transparent about his business relationships. What he did not disclose, however, is that he and his wife remained major shareholders of the company even after he resigned as director – and only divested the approximately 4.2% stake they owned via a holding company in 2013, five years after he said he had ended his relationship with Shirdi. Goyal and his wife set up Flashnet in 2000 and together they owned 99.9% of the stock in this unlisted company. The BJP leader acknowledged his “shareholding of a controlling nature” in Flashnet in his statutory listing of pecuniary interests (link fixed) filed with the Rajya Sabha secretariat shortly after becoming a member of the upper house in 2010, according to the Association for Democratic Reforms (ADR). However, Goyal’s asset declarations filed with the Prime Ministers’ Office in 2014 and 2015 omit any mention of his ownership of Flashnet – or the fact that he and his wife offloaded their shares to Piramal Estates Private Limited. His declaration for 2014, which is dated July 24, 2014, mentions Rs 101,300 as the total value of “unquoted securities (book value)”. Assuming he made an accurate declaration, this figure must have included the book value of the 53.95% of Flashnet’s equity he still owned at the time. A snapshot from Flashnet Info’s director report, showing that the shares were transferred on September 29. His shares were transferred to Piramal Estates on September 29, 2014, according to the director’s report to the company’s shareholders on March 31, 2015, as was the 45.95% share his wife owned. Curiously, Piyush Goyal’s declaration of assets with the PMO dated March 31, 2015, by which time he had sold his shares in Flashnet, mentions the exact same sum – Rs 101,300 – as the total value of unquoted securities at book value. Cabinet ministers are required to disclose assets and investments held by them, their spouses and their dependents. This is done to ensure the highest levels of transparency, especially when it comes to any potential conflict of interest. The value of the shares sold to Piramal also appear not to be reflected in Goyal’s 2016 Rajya Sabha nomination affidavit. Media reports indicate that the Piramal group entered the renewable energy business in 2013 and in July 2014 inked a deal with APG Asset Management for investments worth $1 billion in various infrastructure projects, including in the power sector. In other words, Goyal sold his company to a corporate house which was already invested in the very sector he looked after as a minister of state with independent charge and which had expressly spoken of its intention of expanding its interests in the field. Piramal Estates Private Limited posted losses of approximately Rs 119 crore for FY 2014-15, the year it bought Goyal’s firm. 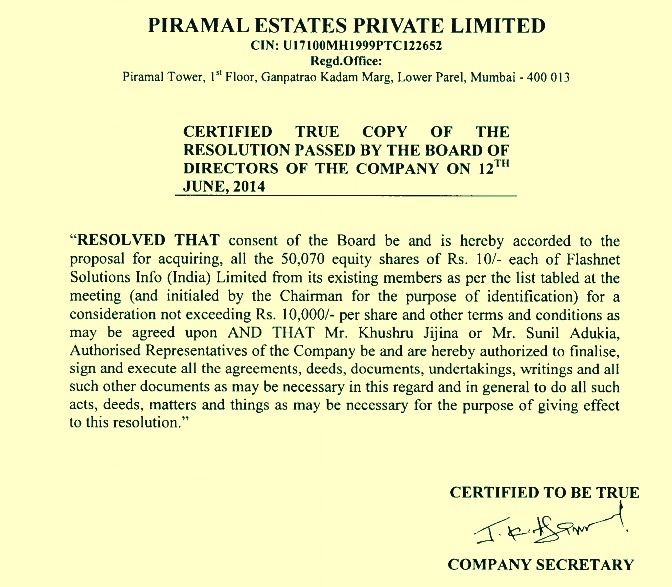 Neither Goyal nor Piramal chose to respond to questions from The Wire about the valuation of the transferred shares but a board resolution of Piramal Enterprises on June 12, 2014 authorised the purchase of the entire stock of 50,070 shares in Flashnet held by Piyush Goyal and his wife “for a consideration not exceeding Rs 10,000 per share,” a maximum premium of Rs 9,990 – or nearly 1000% – over the face value of Rs 10 each. Piramal Enterprises board resolution authorising the purchase of Flashnet shares. Company filings by Piramal Enterprises the next year suggest a value of almost Rs 48 crore was placed on the Goyal family’s shares in Flashnet, which translates to Rs 9,586 per share. In the absence of any response from Goyal, however, it is not possible to confirm the amount actually paid to him. 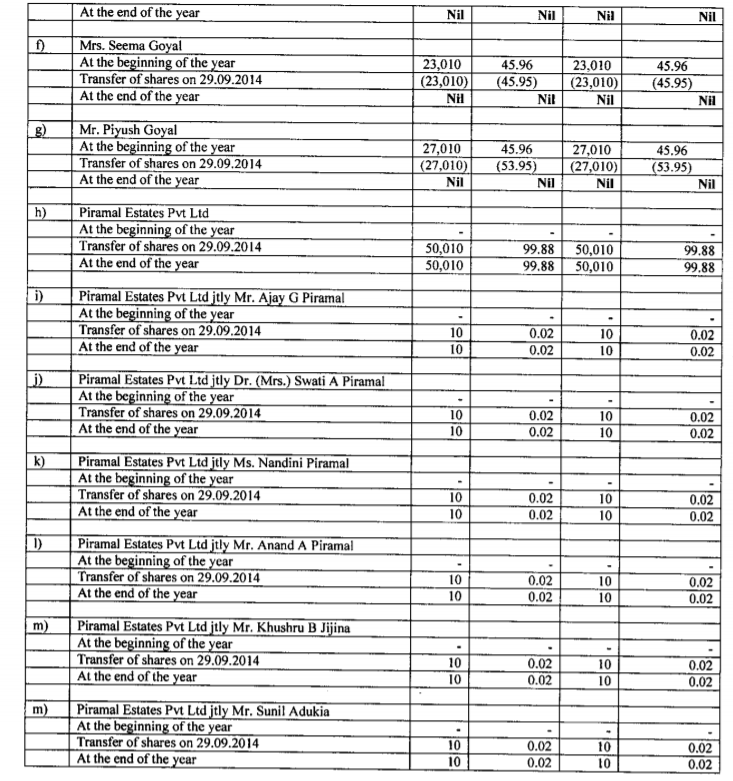 Extract from Piramal Enterprises financial statement for financial year ending March 2015. At the time of the sale, according to the profit/loss statement filed with the Registrar of Companies, Flashnet showed a profit after tax of around Rs 34 lakhs. 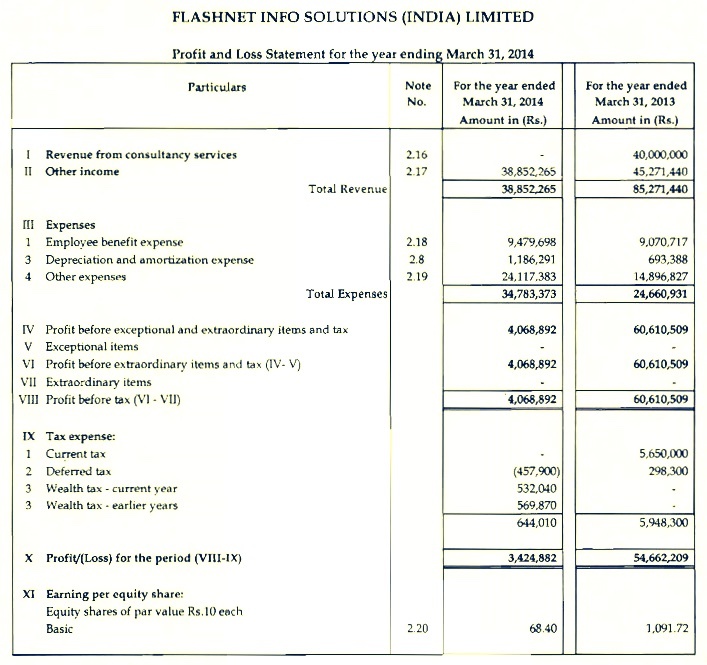 Extract from Profit/Loss statement of Flashnet Info Solutions (India) Ltd for the year ending March 31, 2014, just before the company’s sale to Piramal Enterprises. Six months after the sale, according to statutory filings pertaining to the financial year ending March 2015, the company declared its net worth to be only Rs 10.9 crore. Extract from form AOC-4 filed by Aasan Info Solutions (India) Private Ltd for the financial year ending March 2015. Goyal served as director of Flashnet from November 25, 2004 to May 26, 2014 – the day he was sworn in as minister for power and renewable energy. 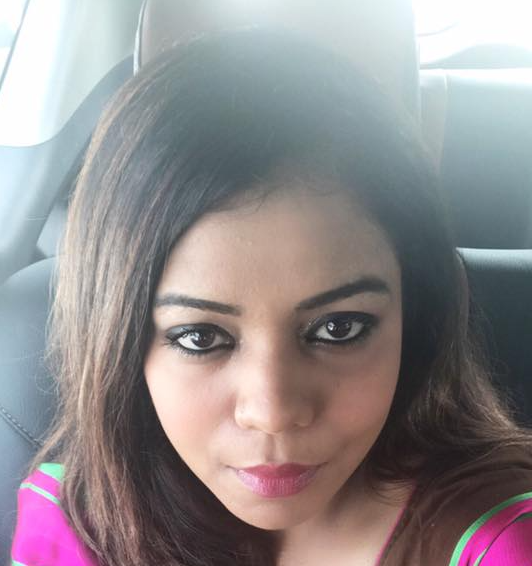 Seema Goyal was a director from April 2009 till May 26, 2014. The couple, however, continued to own almost 99% percent of the company even after resigning as directors. All Rajya Sabha MPs must file a comprehensive listing of their assets and liabilities within 90 days of taking their oath and notify any changes each year as well as provide a list of their pecuniary interests, which includes remunerative directorships and controlling stakes in companies. Goyal did mention his controlling stake in Flashnet in 2011 and the director’s remuneration he drew from the company for the financial year ending 2015, according to data collated by ADR. It is not known what declaration, if any, he made for the Flashnet share sale in the form of an update to his assets and liabilities statement as these are not available for public scrutiny on the Rajya Sabha website. 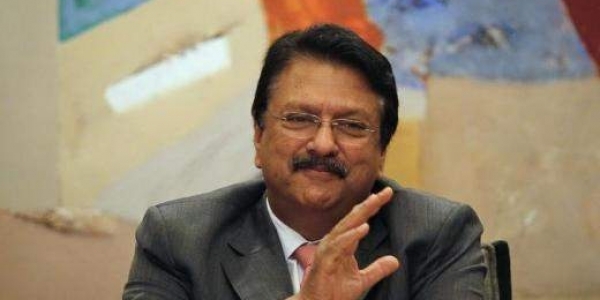 Ajay Piramal did not respond to a questionnaire seeking details of his purchase of Goyal’s company, the pricing and method of valuation of the shares, and the nature of his relationship with the Goyals. Dimple Kapur, the Piramal group’s corporate communications representative, said the company would revert but did not. Questions sent to Goyal’s email addresses and text messages sent to him also went unanswered. The story will be updated as and when Goyal and Piramal respond. The Wire also asked the prime minister’s principal secretary, Nripendra Mishra, whether his office was aware of Goyal’s sale of Flashnet to Piramal – the proceeds of which appear to find no mention in any of the minister’s declarations of assets and liabilities with the PMO – but has yet to receive an answer. After being bought by Piramal Estates in September 2014, Flashnet’s name was changed to Aasan Info Solutions Private Limited. In FY 2017, the firm posted Rs 14.78 crores of losses. Ajay Piramal, his wife Swati, Nandini Piramal and Anand Piramal were directors of Piramal Estates Private Limited at the time the sale of Flashnet was effected. For some reason, the four Piramals stepped down from the board in October 2014, just days after the transaction with Goyal’s firm was completed. Piyush Goyal also owned a stake in Shirdi Industries till 2013, a firm that defaulted the next year on Rs 650 crore worth of loans, mostly taken from public sector banks. Shirdi was eventually given a 60% haircut – banking parlance for a part write off – by the National Company Law Tribunal. In a first of its kind exception to official rules barring defaulting promoters from bidding for and regaining control of their companies once their debts have been restructured, Shirdi’s promoters were allowed to resume control of the company. Until 2013, Goyal’s shares in Shirdi were held through another of his firms, Sajal Finance and Investments. Goyal had been the chairman of Shirdi Industries as well as its non-executive director from 2008 to 2010. Shirdi had started experiencing payment difficulties during this period and formally defaulted in 2014. However, regulatory filings reveal that till the end of 2013, Goyal’s Sajal Finance owned 7,25,000 shares of Shirdi Industries, i.e. 4.18% of the total 1,73,07,000 shares issued. Besides Shirdi, Goyal also held shares of another defaulter firm of the Shirdi group, Asis Logistics through Sajal Finance. In February 2009, Seema and Piyush Goyal became directors of Sajal Finance and in September 2009 became owners of the firm too. Sajal Finance was subsequently taken over by a group company of Shirdi – Labh Capital Services – in 2013. Piyush Goyal’s wife is also the beneficiary of an unsecured loan from Asis Industries – owned by the defaulting promoters of Shirdi – that currently amounts to Rs 1.59 crore. Note: In the opening paragraph, the shares were incorrectly described as having been sold “at a premium of 1000%” instead of at 1000 times the book value. In percentage terms, the premium was nearly 100,000%. You can read the statement issued by the Piramal Group more than 12 hours after this article was published, as well as rejoinders by Rohini Singh and The Wire by clicking here.